The Defense Advanced Research Projects Agency is exploring a “mosaic warfare” concept to see how the military can combine a variety of weapons to perform a single mission in the domains of land, sea and air, National Defense Magazine reported Friday. In the system-of-systems we use today, Grayson said, each piece is designed to fit only one way and this process of putting together a jigsaw puzzle can be challenging. While mosaic warfare still has a specific degree of order, individual pieces can be used in more than one way to make elaborate works of art, he explained. Grayson added he wants to bring the same flexibility and adaptability to other complex systems. 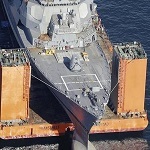 Navy veteran Scott Swift, former U.S. Pacific Fleet commander, noted such a concept would require communication features enabling each weapon to continue operating despite a poor connection. “Windows of communication will open and close rapidly in times that are not under the control of the commander,” he said. 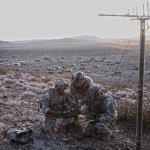 DARPA officials said the agency is already working on software to provide secure, seamless communications to weapon systems that would support mosaic warfare. Meanwhile, the Navy, Air Force and Army are also exploring a similar concept to combine multiple assets and weapon systems, such as ships, reconnaissance aircraft and unmanned underwater and surface vehicles, to enhance operations and the safety of troops in the field.